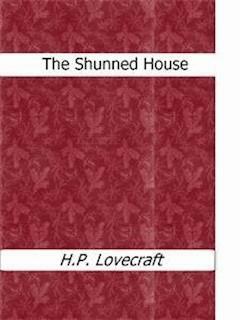 "The Shunned House" is a novelette by H. P. Lovecraft in the horror fiction genre. Written on October 16–19, 1924, it was first published in the October 1937 issue of Weird Tales. From even the greatest of horrors irony is seldom absent. Sometimes it enters directly into the composition of the events, while sometimes it relates only to their fortuitous position among persons and places. The latter sort is splendidly exemplified by a case in the ancient city of Providence, where in the late forties Edgar Allan Poe used to sojourn often during his unsuccessful wooing of the gifted poetess, Mrs. Whitman. Poe generally stopped at the Mansion House in Benefit Street — the renamed Golden Ball Inn whose roof has sheltered Washington, Jefferson, and Lafayette — and his favourite walk led northward along the same street to Mrs. Whitman’s home and the neighbouring hillside churchyard of St. John’s whose hidden expanse of eighteenth-century gravestones had for him a peculiar fascination. The house was — and for that matter still is — of a kind to attract the attention of the curious. Originally a farm or semi-farm building, it followed the average New England colonial lines of the middle eighteenth century — the prosperous peaked-roof sort, with two stories and dormerless attic, and with the Georgian doorway and interior paneling dictated by the progress of taste at that time. It faced south, with one gable end buried to the lower windows in the eastward rising hill, and the other exposed to the foundations toward the street. Its construction, over a century and a half ago, had followed the grading and straightening of the road in that especial vicinity; for Benefit Street — at first called Back Street — was laid out as a lane winding amongst the graveyards of the first settlers, and straightened only when the removal of the bodies to the North Burial Ground made it decently possible to cut through the old family plots. The farm-like grounds extended back very deeply up the hill, al most to Wheaton Street. The space south of the house, abutting on Benefit Street, was of course greatly above the existing sidewalk level, forming a terrace bounded by a high bank wall of damp, mossy stone pierced by a steep flight of narrow steps which led inward between canyon-like surfaces to the upper region of mangy lawn, rheumy brick walls, and neglected gardens whose dismantled cement urns, rusted kettles fallen from tripods of knotty sticks, and similar paraphernalia set off the weather-beaten front door with its broken fanlight, rotting Ionic pilasters, and wormy triangular pediment. What I heard in my youth about the shunned house was merely that people died there in alarmingly great numbers. That, I was told, was why the original owners had moved out some twenty years after building the place. It was plainly unhealthy, perhaps because of the dampness and fungous growth in the cellar, the general sickish smell, the draughts of the hallways, or the quality of the well and pump water. These things were bad enough, and these were all that gained belief among the person whom I knew. Only the notebooks of my antiquarian uncle, Dr. Elihu Whipple, revealed to me at length the darker, vaguer surmises which formed an undercurrent of folk-lore among old-time servants and humble folk, surmises which never travelled far, and which were largely forgotten when Providence grew to be a metropolis with a shifting modern population.